A washing machine that is out of balance needs fixing. It is never a good idea to have machinery vibrating or moving out of balance; it can cause components to wear unevenly and eventually cause damage to the machine. It'll also ruin your floor with haste. To prolong the life of your washing machine, fix any balance problems as soon as you notice them. 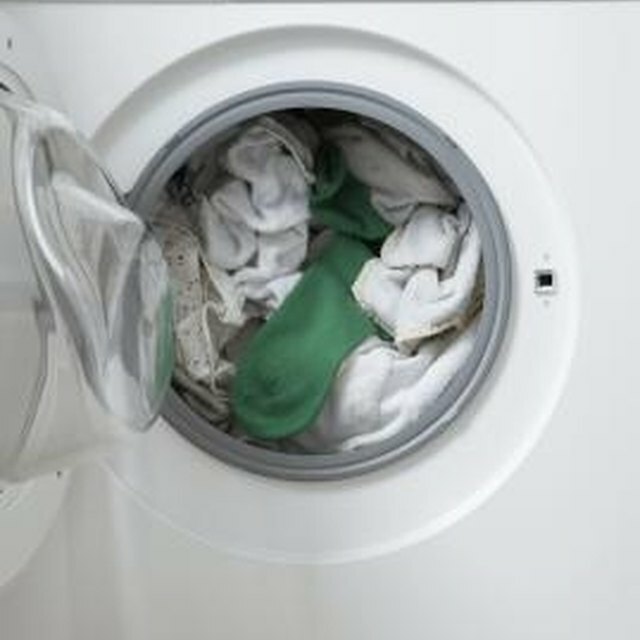 An out-of-balance washing machine could damage your floor and your washer's components. Balance has two meanings in a washing machine. An off-balance load inside the machine makes it impossible for the motor to run efficiently. The result is usually a cycle that stops abruptly, mid-cycle, when the sensor detects the off-balance load, and a pile of soaking wet clothes that the machine did not spin dry. Another meaning for washing machine imbalance refers to a condition whereby the entire machine is out of balance. The result of this is typically a machine that either shakes or vibrates loudly. The easiest explanation for an unbalanced washing machine is a situation whereby the load's weight becomes off-center. This causes the drum to rotate out of alignment; if it gets too far out of alignment, it may cause the machine to rattle or stop. This often happens when you wash only a few items of clothing or if you are washing one large item, like a blanket, with several smaller items and the larger item piles up on one side of the drum. A washing machine should always sit on level ground. Even if the ground in your laundry room looks flat, it may not be perfectly level. Use a carpenter's level to determine in what way your machine is out of balance. Many washing machines have feet on the bottom of the machine that you can adjust independently. Twist the feet to raise or lower the machine until your level shows that the machine is sitting evenly on the ground. If your machine is exhibiting the symptoms of being out of balance but it doesn't have adjustable feet, you can still level the machine. Use a level to determine whether the machine is level. If it is not, try shoring up the corner that is lower than the rest with a piece of plywood or shims to bring the machine level.